The Ukrainian Zenit rocket for Sea Launch's next commercial launch has arrived at the firm's California home base for final assembly, a company spokesperson said Thursday. The Zenit 3SL rocket will launch the Intelsat 19 satellite in late May from the Odyssey launch platform, a modified North Sea drilling rig. Odyssey is steaming back to Sea Launch's home port from Malaysia after dry-docking for a required 15-year maintenance regimen. The mobile platform and the Sea Launch Commander control ship launch Zenit rockets from the Pacific Ocean, along the equator at 154 degrees west longitude. The position provides a performance boost for equatorial orbits due to the speed of Earth's rotation. 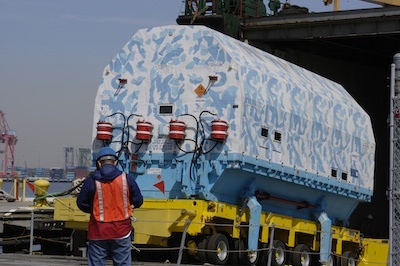 Sea Launch expects Odyssey to arrive in Long Beach, Calif., later this month after stopping in Guam to offload an ill sailor and bunker, according to Peter Stier, a company spokesperson. Kjell Karlsen, president of Sea Launch, said the Sea Launch Commander returned to Long Beach in March from a dry dock in Vancouver, British Columbia. The Zenit rocket's two Ukrainian stages, designed by Yuzhnoye and built by Yuzhmash, arrived at Sea Launch's Long Beach home port April 3. Workers removed the rocket stages April 4 from the transport ship, which departed Feb. 17 from the port at Oktyabrsky, Ukraine. The upcoming launch, scheduled for as soon as late May, will be Sea Launch's second flight from the ocean-based Odyssey platform since the company was reorganized under Chapter 11 bankruptcy. Sea Launch orbited the Atlantic Bird 7 communications satellite for Eutelsat in September from the Pacific launch site, and a Land Launch Zenit rocket delivered the Intelsat 18 craft to space from the Baikonur Cosmodrome in Kazakhstan in October. "It just proved that Sea Launch took a little break off," Karlsen said. "We're not a new entrant. We're a proven launch provider." 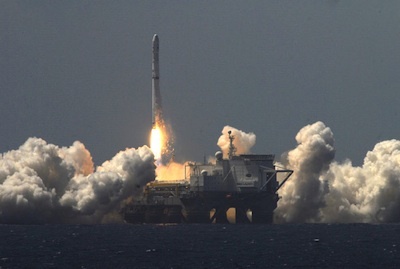 Sea Launch has launched Zenit rockets 31 times from the equatorial Pacific Ocean. 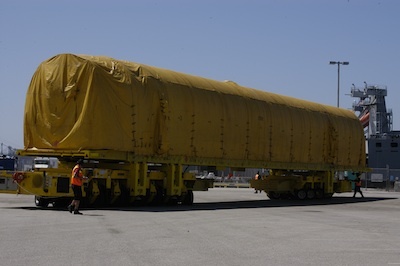 The Block DM-SL upper stage for the Intelsat 19 launch was delivered to Long Beach last year, according to Sea Launch. The upper stage is produced by Energia, the principal owner of the reorganized Sea Launch company which also oversees the overall Zenit supply chain. Delayed deliveries of rocket hardware were cited by Sea Launch as a contributing cause of its bankruptcy. Now with direct control of the Zenit supply chain, Energia officials say they can ensure shipments arrive in California from Russia and Ukraine on time. Sea Launch relocated its headquarters from Long Beach to Switzerland during the Chapter 11 process. The Intelsat 19 satellite for Sea Launch's next mission will be shipped later this month to Long Beach from its Space Systems/Loral factory in Palo Alto, Calif.
Intelsat 19 will provide C-band and Ku-band communications services to the Asia-Pacific region, reaching the United States and Australia. Another Intelsat satellite will lift off on another Sea Launch Zenit 3SL rocket in late summer. Intelsat 21, built by Boeing Satellite Systems Inc., will beam video distribution and direct-to-home broadcasting to users in Latin America for up to 15 years. According to Stier, the Block DM upper stage for the Intelsat 21 mission is now in Long Beach. The Ukrainian components of the booster will arrive in June. Sea Launch has two more firm orders on its books. The company will launch the Eutelsat 70B communications satellite in late 2012 and the Intelsat 27 payload in early 2013. Karlsen said engineers will soon institute evolutionary upgrades on the Zenit 3SL launch vehicle, increasing its lift capacity to geosynchronous transfer orbit up to 6,400 kilograms, or more than 14,100 pounds. Geosynchronous transfer orbit is the standard drop-off point for launches of communications payloads heading for 22,300-mile-high stations over the equator, where satellites appear to hover over a fixed point on Earth to provide broadcasting services. Later changes will allow the Zenit 3SL to haul up to 6,700 kilograms, or 14,770 pound, into such an orbit.